This week, let’s savour a whole new aroma, marinated salmon from chef Đức. Clean salmon fillet under running water, use a clean cloth to absorb water on fillet’s surface. Mix sugar and salt with 2:1 ratio. Add pepper, white wine, grated lime rind and dill before pouring the mixture on the salmon’s surface. Wrap the fillet with food wrapping film and place in the fridge for 1 day. Take the salmon out, trim away the skin and cut a 0.5 to 0.7 cm thickness of fillet. Blend avocado with pepper, salt, lime juice and olive oil. 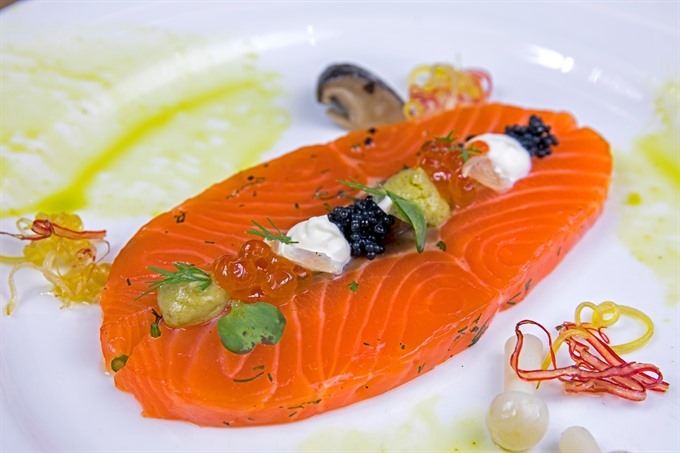 - Place a slice of salmon on the dish, top the salmon’s surface with sour cream, avocado sauce, salmon roe, caviar, dill, lime pulp and Đà Lạt flower.